Scientific Name :- Hypophthalmichthys Molitrix. Common Name :- Silver Carp. Silver Carp is the fish of China; it was introduced for the first time in 1959 in India. 300 Silver Carp fingerlings on an average of weight 1.4 gram, and 5 centimeter of length and 2 months of age had been brought to Central Research Institute for inter terrestrial fish Cuttak (Odisha) in India as a gift from the Tone river of Japan. The main objective of bringing this fish to India was to get low cost Fishery food from a limited space. Today, it is easily available because of it is reared in several ponds and reservoirs of Madhya Pradesh. Body is flat in both sides, Normal Head, larger mouth and the lower jaw is slightly curved upward, small eyes and smaller scales under the center line of body, rear part of the body is blackish grey and remaining part is golden in color. It receives its food from surface and mid level of water, plant plankton is the most favorite food of silver Carp, its alimentary canal is 6 to 9 times larger than its body. Its larvae are of 12 to 15 mm in size, and takes Fri and animal plankton as its food later it eats plant plankton. Its growth rate is higher than other Indian Safar fishes. In 1992-93, a large number of Silver Carp fish were dead in Powai Lake of Mumbai due to acute lack of oxygen, In these fishes the Silver Carp of maximum size was 1.02 meter of length and the 50 kilogram of weight. A good growth of silver Carp has also been seen in the State, but its presence affects the growth of Catla fish. It matures for breeding in 3 years in China, and in India it attains the sexual maturity at the age of 2 years. Its actuate breeding is done through stripping method. In China , its breeding period starts from April to June in rainy season in rivers, In Japan starts from may - June to July, In Russia it breeds into flowing stream of water after coming upward. In India, In India, it had been done strip for breeding in 1966 in stagnant water in the mid March at the stage of maturity and in July - August when it was fully matured. Its breeding period is from June to August in rainy season in the State. On an average the egg fertility of Silver carp is, 100000 eggs per kilogram weight. Its eggs are water sinking, its size is of 1.35 mm, and it increases up to diameter of 4 to 7 mm after being fertilized. Hatching takes 18 to 20 hrs at the temperature of 28 to 31 degree centigrade. The size of hatchling is 4.9 mm, The yolk sac dissolves completely after 2 days of hatching similarly to Indian Safar. To fulfill the requirement of fast growing fishes, it had been kept in Research Center Cuttack after bringing from Japan in 1959. Based on experiments it has been found that despite of similarities with Catla Fish in eating habits it has enough differences. 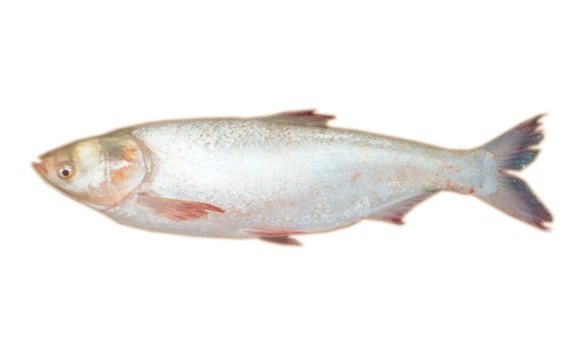 Silver Carp is used as a main species in mixed rearing method of Carp fishes. Its growth is fast enough it becomes 1 kilogram of weight within 6 months of rearing. Silver Carp has less fish thorns than catla. Its market rates are lesser than Indian Safar. It has not been supported like other main Indian safar by the fish farmers due to its taste.